“29th Thursday rather fine cool weather for Sept. I did my choars was at the store all day & evening came home about 8 ½ & went to bed about 9 ½ tiard lonely & sick. “30th Friday rather a cloudy damp disagreeable day. I did my choars was at the office all day & evening came home about 8 ½ & went to bed 9 ½ tiard lonely & about sick. “October 1st Saturday A cool cloudy damp day & evening. I did my choars was at the office all day & evening came home about 8 ½ & went to bed about 9 ½ tiard lonely & sick. “2nd Sunday rather a fine day & evening but some cloudy. I did my choars was round home all day went to office twice came home & went to bed about 9 nearly sick. A Wellman was here, I turned my cows into Hoyts lot & brought Hoyts bedclothes home with me. “3rd Monday rather fine cold weather for Oct. I did my choars was at the office all day & in evening came home at 8 ½ & went to bed about 9 ½ tiard & nearly sick. “4th Tuesday rather fine weather & pretty dry. I did my choars was at the office all day & evening came home at 8 ¼ went to bed 9 ½ tiard lonely & nearly sick. The Warrenville Historical Society is happy to announce “Dead Men Talking – And Some Women – VII,” which will be held on Sunday, October 19, 2014. The outdoor 45 minute tours will start every 15 minutes beginning at 6:00p.m. with the last tour at 7:30p.m. Tours are given on a first come first serve basis. For those not wishing to walk through the cemetery, a presentation by the interpreters will be given at 5:00p.m. in Trinity Lutheran Church. During this year’s event, heroes of Warrenville and the history of their families will be highlighted, including those who helped found the Warrenville Fire District, which celebrated its 75th Anniversary this year, and Warrenville veterans from the War of 1812, the Civil War and World War I.
Singers performing historic songs during the 2013 cemetery walk. Cemetery tours begin at the Warrenville Cemetery, located on the north side of Warrenville road between Curtis and Warren, Warrenville, Illinois. 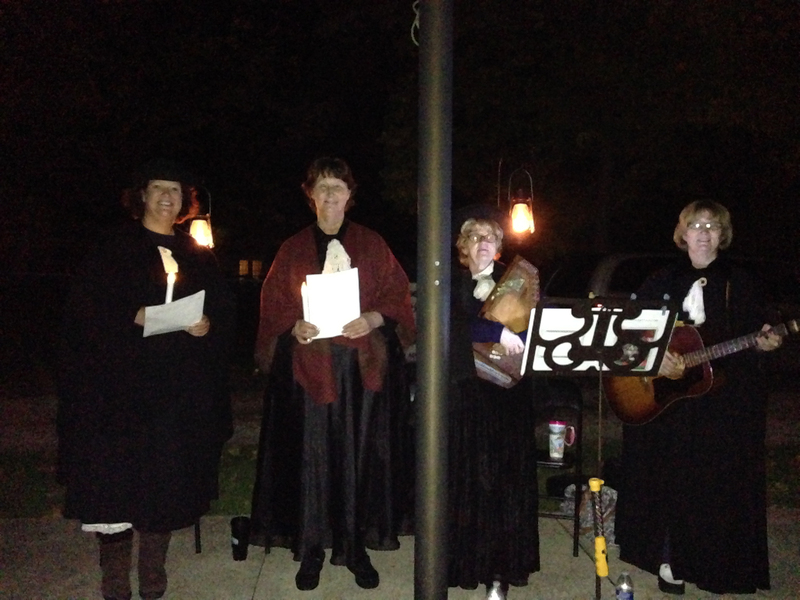 Luminaries will light the way to lantern-lit gravesites where costumed interpreters will tell the stories of Warrenville citizens who lived 150 years ago in 1864, during the long second year of the American Civil War. Tour admission is free but donations will be accepted and are appreciated. All donations benefit the Warrenville Historical Society. Parking is available at Trinity Lutheran Church located at the N/W corner of Curtis and Warrenville Rds. Refreshments will be served at Trinity Lutheran Church after the tours. “22nd Thursday A fine day but warm for Sept I did my choars was at the office all day & evening came home about 8 ½ tiard & went to bed at 9 ½ tiard lonely & about sick. Mrs Potter went to Mr Owens. “23rd Friday fine but some cloudy & rained in afternoon I did my choars was at the office all day & evening came home at about 8 ½ & went to bed about 9 ½ tiard lonely & sick. “24th Saturday A cool cloudy damp morning but a fine cold day & night froze. I did my choars was at the office all day & evening came home about 8 ½ & went to bed about 9 ½ tiard lonely & nearly sick. Mrs Potter went to Pelhams & Lanes to stay over night. “25th Sunday rather a fine cool cloudy day & evening I did my choars was at the house amost all day went to the office after breckfust choared round was about sick went to bed about 9 tiard lonely & sick. Mrs Potter was at Pelhams & Lanes all day, got home at ___. “26th Monday rather fine weather for the season I did my choars was at the office all day & evening came home at about 8 ½ & went to bed about 9 ½ tiard & nearly sick & lonely [in margin] fair at Wheaton commenced. “27th Tuesday fine weather for the season I did my choars was at the office all day & evening came home about 8 ½ & went to bed about 9 ½ tiard lonely & nearly sick. “15th Thursday A fine pleasant morning but dry I did my choars was at the office all day & evening came home about 8 ½ & went to bed about 9 ½ tiard & nearly sick & lonesome as can be. George Potter started in the stage to go to Chicago to go back to his Regt at Little Rock Arcanses, his wife felt bad. “16th Friday rather fine weather but some cloudy I did my choars was at the office all day & in the evening came home about 8 ½ & went to bed about 9 ½ tiard lonely & nearly sick [in margin] Go. Potter left Chicago tonight. “17th Saturday rather a fine day but some cloudy & windy. I did my choars was at the office all day & evening came home about 9 & soon went to bed tiard lonely & sick Mrs Potter walked up to Mrs L Kenyons started about 4 oclock in afternoon. “18th Sunday rather a cloudy morning with a light sprinkle rather a fine day but some cloudy I did my choars was at home all the forenoon a writing & choaring round I went about 2 oclock to Kenyons after Mrs Potter, got back towards night went to bed about 9 nearly sick. “19th Monday rather fine weather for the season but dry I did my choars was at the office all day & in the evening came home about 8 ½ & went to bed about 9 ½ tiard lonely & nearly sick. “20th Tuesday rather fine weather for the season I did my choars was at the office the most of the day came home about 8 ½ & went to bed at 9 ½ tiard & nearly sick [in margin] Geo Potter started from Kankakee to go to Regt A T Jones was married about this time. “8th Thursday fine weather but dry I did my choars was at the office all day & evening came home at 8 ½ & went to bed at 9 ½ tiard sick & lonely. “9th Friday rather fine weather. I did my choars was at the office all day & in the evening came home about 8 ½ & went to bed about 9 ½ tiard & sick. “10th Saturday fine weather but dry I did my choars was at the office all day & in evening came home 8 ½ & went to bed at 9 ½ tiard lonely & nearly sick [in margin] George P. got home from Chicago. “11th Sunday A fine day for Sept I did my choars was at the house all day & in the evening choaring round went to office twice came home and went to bed at 9 nearly sick H Goulds wife went up to Cals, George & Elizabeth went up to 3. “12th Monday A fine day I did my choars was at the office all day & in the evening came home at 8 ½ & went to bed at 9 ½ nearly sick tiard & lonely, George Potter is a getting ready to go back next Thursday to his Regt. “13th Tuesday rather fine weather for Sept I did my choars was at the office all day & in the evening came home about 8 ½ & went to bed at 9 ½ tiard lonely & nearly sick. On Monday, September 8 at 7PM at the Historical Museum, 3S530 Second Street, the Historical Society will hold its Annual Meeting and invites the public to attend a quick business meeting to hear about the programs of the Society followed by a presentation on the history of St. James Farm by Kevin Davis. What is known today as St. James farm was an area that played an important role in the early settlement of DuPage County. Please enjoy this except from Leone Schmidt’s The Life and Times of Warrenville about the first settlers in DuPage County and the troubles they faced in their first years in the area. 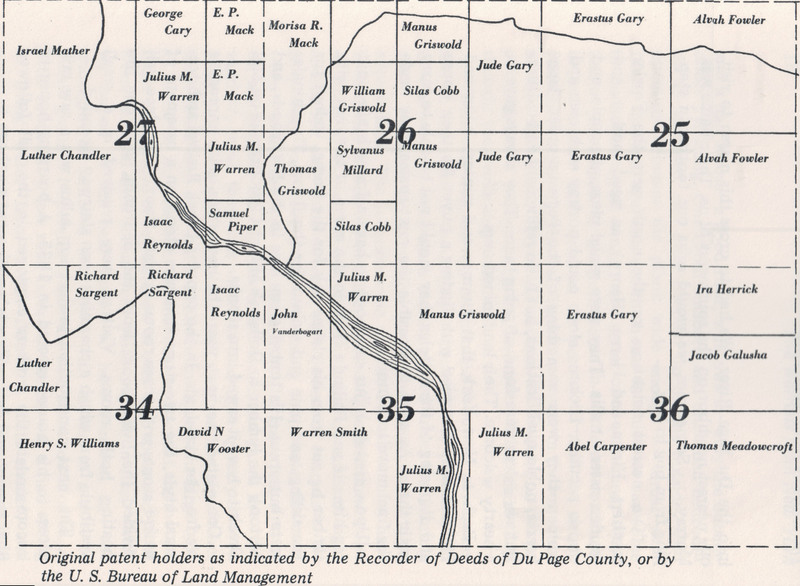 “Spring 1832 saw the west branch of the DuPage Rive dotted with settlements extending north as far as what we know now as Winfield Township of DuPage County. “The honor of ‘first’ within the boundaries later established for Winfield Township goes to Erastus Gary-grandson of Josiah Gary and son of William Gary, both ex-Revolutionary soldiers. William, a school teacher and farmer, had died at the age of 51 when Erastus, the third of seven children, was only eleven. After a few years of eking out a meager existence from the 13 acres of rocky soil that had been his allotment from the family estate, at the age of 25 he sold his share to his elder brother Charles and left Connecticut in 1831. He traveled by horse or carriage as far as St. Joseph, Michigan and then crossed the lake in a canoe to Chicago and continued 28 miles further west (probably on foot) where he staked out 640 acres-the present location of McCormick’s St. James Farm. Too late in the season for breaking sod, he returned to St. Joseph to teach school during the winter. In the spring he paddled back in a homemade dug-out with three fellow travelers. Many of the settlers fled to Fort Dearborn, in Chicago, for protection from the fighting. Women and children spent the entire summer confined in the Fort, while the men protected their recent claims and attempted to plant and care for their fields. Five years later the Garys established a settlement in present day West Chicago near Route 59 and Roosevelt Road. Erastus Gary became an influential man in DuPage County and worked with the Wheaton brothers to shape the town of Wheaton’s development and growth. Erastus’s son, Elbert Gary, became a leading steel man, creating the town of Gary, Indiana, for the sole purpose of making steel. “September 1st Thursday rather a fine day & evening I did my choars was at the office all day & evening came home about 8 ½ & went to bed 9 ½ tiard lonely & nearly sick. Robert Millard Jr got to his fathers here about 5 oclock this morning & his father died about 8-3/4 this forenoon. “2nd Friday Rather fine weather for Sept but dry I did my choars was at the office all day & evening came home about 8 ½ and went to bed about 9 ½ tiard & nearly sick etc Robert Millards funeral was today at 2 oclock at Baptist house Elder Ofield preached. “3rd Saturday A pretty fine day but some cloudy. I did my choars was at the office all day & in the evening came home about 10 oclock & soon went to bed tiard & sick. “4th Sunday rather a fine morning but cloudy I did my choars was at the house the most of the day a choaring round was at the office twice & fixed straw stack etc went to bed about 9, nearly sick & lonely, it rained a little between one & two. “5th Monday rather fine weather for the season. I did my choars was at the office all day & in the evening came home about 8 ½ & went to bed about 9 tiard lonely & sick. “6th Tuesday fine weather for Sept but rather dry I did my choars was at the office all day & in the evening came home about 8 ½ & went to bed about 9 ½ tiard & nearly sick [in margin] George went to Chicago got his eyes doctered.